Mythologies considers stories that have been transmitted to us by teachers, writers, parents, politicians, and pop stars—and the mechanisms of their transmittal. In Issue 21, Natalie Diaz takes us to the banks of the Colorado River, Rodrigo Hasbún seeks out fabled Incan cities, T Kira Madden goes to the Olympics, and Carmen Maria Machado assembles a pantheon of feminist saints. 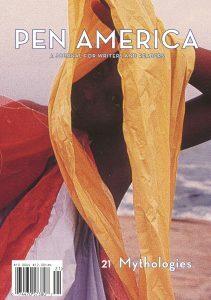 With fiction by Venita Blackburn, Beatriz Bracher, Andrés Neuman, Kevin Robert Schaeffer, and Jenny Zhang; poetry by Adonis, Tina Chang, Natalie Graham, Rickey Laurentiis, Layli Long Soldier, and Kei Miller; nonfiction by Ursula K. Le Guin and Kevin Young; and conversations with Chimamanda Ngozi Adichie, Trevor Noah, Samanta Schweblin, Samantha Bee, Masha Gessen, Édouard Louis, Garth Greenwell, Malika Bilal, and Carrie Brownstein.